Lecture What is uncertainty, and how do we deal with it? There’s a small cottage industry built on the distinction between risk and uncertainty. One of the founders of this industry was Frank Knight, a University of Chicago economics professor who taught there between the late ’20s and the mid-’50s. Although even Knight seems confused, the basic distinction is that risk is something you can insure against–which means the probability of specific losses (events) is known or can be calculated, and uncertainty is when you can’t assign probability to outcomes. I generally find most conversations about risk and uncertainty unenlightening. Many get bogged down in semantics, many are just confused or confusing, and rarely do they increase my understanding. You should read the paper “What is Risk?” (link is below) even though I don’t agree with everything that’s written there. I think there IS a valid (philosophical) discussion that we could have about uncertainty, risk, and related topics. I personally like the idea of using risk as a term to describe a action with a known probability distribution over outcomes. I also think there’s ignorance–where because of lack of experience or knowledge, we just don’t have a complete probability distribution or description of the outcomes and likelihood of each, but we know a little bit about it. Pure Knightian uncertainty either describes everything (we never know the complete probability distribution of most things, except maybe all the games offered at a casino) or it describes nothing (other than some truly obscure or irrelevant things.) I tend to use the term UNCERTAINTY as a general word to describe that which is unknown in advance. I’m uncertain how each of you will do in this class, but come the end of the semester, I’ll have a complete and perfect idea! As for risk, it’s just not a particularly helpful term because of how it’s used in everyday speech. According to Merriam-Webster, risk is “possibility of loss or injury” (definition 1) or “the chance that an investment (as a stock or commodity) will lose value” (definition 4). Nearly all uses of the term risk highlight the negative aspect of loss, or danger. We wouldn’t call a lottery risky–there’s a certain loss (the cost of the ticket) and money can only be won, not lost. The Russian roulette scene in the Deer Hunter is clearly one of risk! If you look up a finance or investment book, you’ll find that the term risk has a far less negative definition. The NASDAQ website defines risky asset as “an asset whose future return is uncertain.” Sounds like uncertainty to me–or at least “unknown in advance.” Yes, you can own an asset that falls in value over time (bad,) or you can own one that increases in value over time (good), but the disciplines of economics and financial economics use the term risk to mean uncertainty, and it is neither good nor bad. So we are faced with a dilemma. Two terms, many definitions, no clarity. I DO NOT use the term risk to mean “bad outcome.” To me, there is nothing negative about risk, other than the very general thought that I’d rather know, in advance, what is going to happen than not (but that’s called risk aversion–more later.) I use risk and uncertainty interchangeably. Not because I want to confuse you, but because I want to de-emphasize the loss/negative-only interpretation of risk. From a statistical view point, uncertainty is the basis for probability theory. There’s an experiment in which some process (rolling a dice) generates specific outcomes (the number of dots on the upper face). 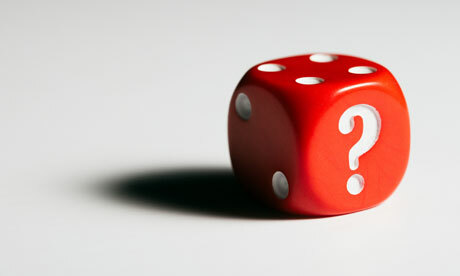 If the die is fair, then we can specify the probability distribution over all outcomes: Pr(N=i, i=1…6) = 1/6. This distribution satisfies all the rules of a probability distribution. It DESCRIBES our uncertainty. We KNOW one of six faces will appear, but WHICH face is unknown in advance. Note that uncertainty is a consequence of how we experience time. (This is deep…) Because time seems linear (past, present, future) then before something happens we are uncertain as to the outcome, so we must form expectations as to what will happen. Once it happens, there is no more uncertainty–the outcome is realized and we can observe it. As good Bayesians, we can use the observed outcomes to revise our understanding of the probability distribution, and make better predictions of the future. In finance, asset risk is measured by the variation in returns from that asset. As we will see in the next topic (2.1), we can calculate the expected return and risk measure for every asset, and every portfolio of assets. These are fundamental measures to know when choosing and managing portfolios. Go to this website and take the risk assessment. This is an academic quiz, so as you complete it you are also contributing to research–thanks. Do you take risks? Do you have health insurance? Would you drive your car home after having two drinks with a friend? Would you buy a lottery ticket? Most people don’t THINK about their attitudes to risk very much, but their choices tell us a lot about how they view risk. Unfortunately it’s not easy to describe a person’s willingness to accept risk. Some people pay health insurance premiums, but text while they drive. Buying insurance says you’re risk averse, while texting while driving is risk seeking behavior. There’s a lot that economists, psychologists, behavioral economists have written about risk. For a long time, the basic model was Expected Utility Theory. B: Toss a fair coin, if Heads you win $20, if Tails, you lose $20. Would you play this game? Since most people don’t like losing money, they would probably play the game. There’s a 50:50 chance you will win $20. But there’s also the same chance you would lose more than $10–$20 in fact. Is there a way of thinking about this game more systematically? In statistics there’s a concept called Expected Value, which can be calculated for probability distributions. EV = Pr(L1).L1 + Pr(L2).L2 + … + Pr(Ln).Ln where there are n possible outcomes Li, i=1…n and Pr(Li) is the probability that outcome Li occurs. All the probabilities have to sum to one, to be sure it’s a probability distribution. so EV(game) = -$10 + $10 = $0. Choice B is “worth” $0. Compared to the certain loss of $10 from choice A, it would seem best to go for the toss of the coin. B: toss a fair coin: if Heads win $20, if Tails win $4. The expected value of B is EV(B) = (0.5)$4 + (0.5)$20 = $12. So choice B has the same (expected) payoff as the certain payoff from choice A, but choice B is risky. You can’t actually win $12 from B, only $20 (good) or $4 (not so good.) Many more people would take the certain choice in this game. But why? The explanation lies in expected utility. 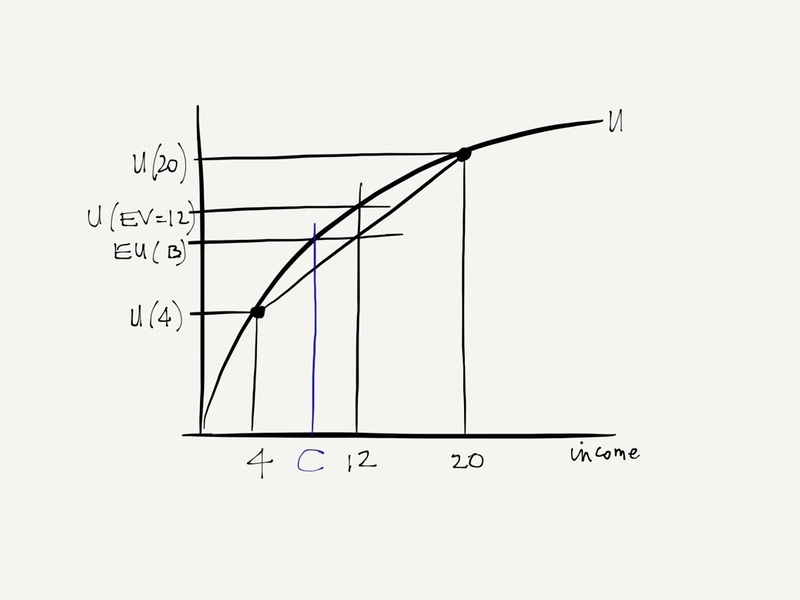 In the diagram above, the Expected Utility function is concave–it displays diminishing marginal utility as income increases. In this case the utility of the expected value of the outcomes is greater than the expected utility from tossing the coin. In other words, a person with this shaped utility function would prefer a certain $12 than play a game with an expected value of $12. If a person has such a utility function, they are risk averse. If a person has a convex utility function, they would prefer to toss the coin than take the $12, and are thought of as risk-loving, or risk-seekers. The diagram of the simple model reveals a few other interesting things. Notice that the utility from playing the risky game, B, is EU(B), which is the same level of utility associated with the certain amount C on the horizontal axis. The person is indifferent between tossing the coin and the certain payment of C. The expected value of the coin toss is $12, but the equivalent certain payment is less than $12. Maybe it’s $10. The amount C is called the certainty equivalent, and the difference between the EV(B) and C is important. Consider offering this person insurance that would pay them $C rather than face the risky outcome of the coin toss. How much would the person pay to buy the insurance? Up to the difference EV(B)-C. A risk averse person would rather a lower certain payment than have to face a risky choice. Expected Utility Theory is quite powerful, but has many limitations. There are too many inconsistencies with observed behavior for some people to think it’s a good model. One alternative model has emerged called Prospect Theory. This theory was developed by Daniel Kahneman and Amos Tversky. Kahneman is a winner of the Nobel prize in Economics (Tversky died before the award was made) and has a best selling book called Thinking Fast and Slow,) Prospect theory tries to describe people’s behavior more closely than EUT. The major insight of Prospect theory is that people view gains and losses relative to a reference point, rather than absolutely as assumed in EUT. People are sensitive to changes in wealth, and more sensitive to losses than gains of the same magnitude. 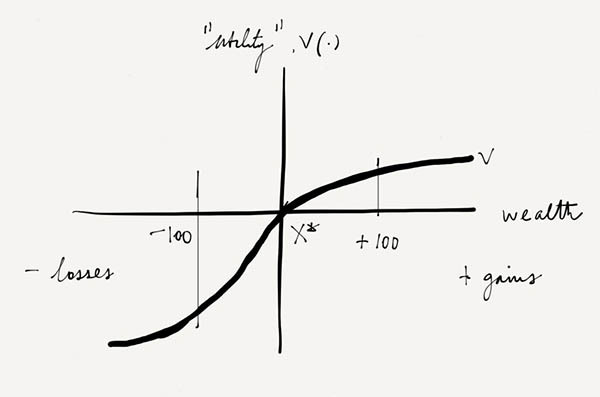 The diagram below represents a value function (equivalent to the utility function) defined over gains and losses relative to a base point of X*. Prospect theory has been successfully applied to financial behavior, especially that of investors. Read this paper by Barberis from 2012 for more details (even though the paper is somewhat technical, the main points are clearly stated.) Check out this very informative reference website for more about Prospect Theory. One of the major services offered by financial advisors is creating an investment portfolio that matches the risk attitudes or tolerance of the client. By many different means, they assess the risk preferences of the client, then construct a matching risk profile for the assets (securities) in the portfolio. The ideas presented above provide the theory behind assessing risk preferences or attitudes. Unfortunately what these advisors do in practice is not real science, and they have varying success with the matches. Fortunately most clients don’t have a clue, and are forgiving. The average investor only has a very rudimentary understanding of his/her own risk tolerance. But it’s a good idea to reflect on your own choices (not just an abstract reflection) as a guide to assessing your attitudes to risks. With knowledge of one’s risk tolerance, an investor can venture out into a world full of investment opportunities. Each opportunity offers an expected return, and an associated risk–more on this later. Take the Quiz on the Learn website. Risk reduction may be a goal, and risk avoidance may be possible, but eliminating risk is practically impossible. There are few certainties in the future (even though everything in the past is knowable, except maybe who killed JFK…) If risk really is uncertainty, then we all face uncertain futures. Rather than trying to eliminate risk, people should be trying to manage it. Managing risk requires understanding the nature of uncertainty, and, when possible, taking advantage of it. Successful investing is very much an exercise in managing risk: reducing it where possible, avoiding when appropriate, and using it when it offers advantage. Risk is a rose–the joy of the scent, the pain of the thorns. 1. What is Risk? The first chapter from a book titled Strategic Risk Taking by Aswath Damodaran, Finance Professor at NYU provides a nice introduction to the concepts of risk and uncertainty. 6. Review of Prospect Theory by Barberis, 2012. Write one-page (typed) on BETA. It’s a measure of relative risk for an individual stock, or a portfolio of securities. Give examples, and argue if beta is a measure investors should pay attention to. Discuss any, or all, of the following questions in the online Learn discussion forum for this Topic. Does your experience (reading, personal) support these research findings? Give examples. 2. The most common way people manage risk is through insurance. You can buy car insurance and health insurance, for example, but there are lots of risks you can’t buy insurance for (even though Lloyds of London might underwrite any policy for a price.) And even if you can buy insurance, it compensates for losses rather than reverse those losses (you get money when injured, you don’t get your health back.) Do you think we should have more insurance for risks like losing money in the stock market? 3. Why do you think Daniel Kahneman was awarded the Nobel prize in economics? He is a psychologist after all.